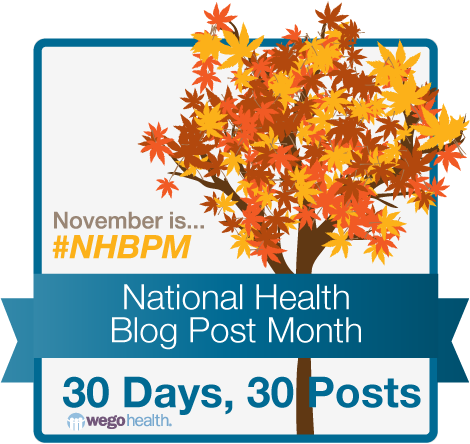 I’ve signed up to participate in NHBPM for the last couple of years. Unfortunately, I never make it past the second week. I get too busy thinking about other things, projects. . . SQUIRREL! But, this is an easy prompt to answer. I write about my health because I want others out there, going through the same struggles, to know they’re not alone, and hopefully share some ideas that have worked for me or others that didn’t. This world is a big place. There are a lot of people, each with their own difficulties, pressures, illnesses and worries. You know that great feeling when you run into someone who knows EXACTLY what you’re going through? It’s magical. Somewhere out there, there’s a woman who’s just been diagnosed with breast cancer and her Dr. said they’re going to do this. . .this. . thing, with needles and . . .oh, it’s so hard to remember what he said. I really didn’t hear anything after he said, “cancer.” Is this going to hurt? How will I feel after? Can I go back to work? I wish I could ask someone. . . That’s who I write for. Hi, I’m Barb and I’ve had breast cancer and I’m 19 months out from that dreadful day and let me help you know what to expect and what some of those big words mean. Hi, I’m Barb and I’ve had diabetes since 2009. While it was really overwhelming at first, I PROMISE you will make sense of it. Take my hand. . .let me show you some tricks I learned from other online writers. I say it all the time. . but, since this is what I’m writing about today, I’ll say it again. This journey of health and wellness is like being on a dirt road. Some people are further ahead, they were diagnosed a long time ago. Some are behind, they just found out their pancreas stopped working, or they have a lump. The people up ahead, had others pointing the way and now they turn back to those just starting the journey and call to them. . .”hey, follow me, I’ll show you the way. Watch out for that rut in the road and the river off to the side.” One day, it’ll be your turn to turn back and help someone else along the way. Until then, here’s my hand, here’s my heart, listen for a familiar voice. . .follow along, we’ll do this together.